The failure of Geert Wilders’ right-wing, anti-Islam Freedom Party (PVV) to triumph at the polls this week in the Netherlands and overtake Prime Minister Mark Rutte’s center-right People’s Party for Freedom and Democracy (VVD) is being hailed as proof of the limits of anti-Muslim rhetoric and even the “waning” of the appeal of right-wing populism. More than a few pundits will portray the Dutch election results as the halting of the march of the sort of populism that gave us Brexit and the election of Donald Trump in the United States. And it may well prove to be so. But a closer reading of Dutch politics in recent years leads one to a more nuanced understanding and interpretation of the results, in which Wilders’ party came in second with 20 seats in the 150-seat House of Representatives—a gain of five seats but a weaker showing than in 2010. The American dictum that all politics is local also applies to the Dutch elections. Most Dutch citizens probably voted not in support of a stronger Europe, but on issues that matter to them individually: the perception that the benefits of globalization are distributed deeply unevenly, the sense of loss of core Dutch values and culture (enter immigration), concerns about still very high youth unemployment (about 11 percent), fears about the erosion of social supports and especially the pension system, rising intergenerational inequality, and the fact that citizens over age 50 who lose their jobs have slim prospects for re-entering the labor force at a decent level, if at all. In the opposition, Wilders had a hand in reorienting the recent campaign away from economics (and even security) toward issues of Dutch national identity and vitriol against “outsiders”— moving other parties farther to the right in the process. His progress here has not been halted; if anything, being able to now call PVV the second-largest party in the country will only put wind in Wilders’ sails. 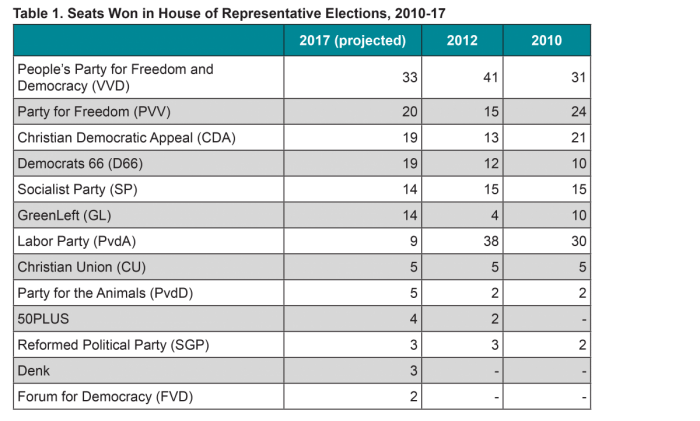 The real story then may not be Wilders’ rise to power per se, but the fragmentation of Dutch politics (see Table 1), and the ability of outsiders like him to shake up elections that have long been dominated by two or three mainstream parties. The recent successes of various right-wing populist and anti-immigration political parties in elections in Austria and various German Länder, and the rise in popularity of such parties in Sweden, Denmark, Finland, Belgium, most of the Visegrad countries (Hungary, Poland, Slovakia), and several other EU Member States have been touted as evidence of the march of populism. What all these parties share is their embrace of those who feel they no longer have a voice. Two traumatic events created an opening for Wilders on the Dutch political scene: the assassination of right-wing politician Pim Fortuyn in 2002 and the subsequent 2004 murder of filmmaker Theo van Gogh by a Dutch-Moroccan citizen after he criticized the treatment of women in Islam. While Fortuyn’s death left a large gap on the far right, van Gogh’s sparked a wave of retaliatory incidents against Muslims and crystallized an already large and growing skepticism about the willingness of Muslims to integrate into Dutch society. Wilders, who founded the radical-right PVV in 2006, capitalized on this by anchoring his platform in a virulent critique of Islam. And while his incendiary rhetoric has been disavowed by the mainstream, his popularity spiked after he was found guilty in December 2016 of hate speech against Moroccans. This combination of nationalist fervor rooted in aggressive anti-Islam, anti-EU rhetoric, and more recently, a focus on security, seems to have found increasing salience in a post-Brexit world in which Europeans are still reeling from Europe’s uncontrolled inflows of migrants and refugees as well as the terrorist attacks in Paris, Brussels, Nice, and Berlin in 2015-16. But social and cultural concerns have always been front and center—particularly in response to triggering events. A February poll by Ipsos found that 86 percent of respondents said they were “quite worried” or “very worried” about norms and values in the Netherlands, compared to 61 percent expressing concern about the economy. Earlier polls told a different story. Five consecutive Eurobarometer polls from 2014 to mid-2015 show that the three most important issues cited were health and social security, unemployment, and economic issues, with immigration making the top three only in late 2015, coinciding with the peak of flows across the Mediterranean. And as concerns about uncontrolled immigration waned towards the end of 2016, health and social security again resumed first place, with immigration a distant second. Wilders demonstrated his growing influence long before Dutch citizens went to the polls. During the campaign, questions of how to define and defend Dutch national identity and values took front stage over economics and even security issues—reflecting his core concerns. The result was other leading candidates moving farther to the right on these issues in order to deny Wilders political space—a classic political maneuver. Rutte purchased a full-page newspaper ad on January 23 saying those who refuse to adapt or otherwise criticize Dutch values “should act normal or leave.” This all too obvious—and successful—attempt to lure voters away from Wilders was followed by another, equally opportunistic, set of incidents involving the Turkish diaspora. The weekend before the election, the Dutch government denied two Turkish ministers the opportunity to campaign on Turkish President Recep Tayyip Erdoğan’s behalf at mass rallies of Turkish-origin groups. The resulting diplomatic row contributed mightily to the sense that Rutte was strong on the issue of divided loyalties. And the CDA leader, Sybrand Buma, also joined the fray by proposing singing the national anthem in school, and recently called for those with dual Dutch-Turkish nationality to give up their Turkish passports—presenting adherence to Dutch values as a zero-sum game. What Role Does Immigration Play? As previous Migration Policy Institute (MPI) research has shown, large-scale immigration, on its own, does not fully explain the rise of anti-immigration political parties around the world. It is the confluence of factors—such as the pace of change, whether immigration is planned and orderly or chaotic, the ethnic and religious composition of the newly arrived, and the influence of popular politicians who are immigration skeptics—that spur anti-immigration reactions. Many countries with persistently high immigration levels have not scapegoated immigrants even when economic times are hard. Spain is an example of exponential growth in the immigrant population, yet no radical-right party has emerged on its national stage. In the Netherlands, the pace of growth in immigration has been quite rapid. 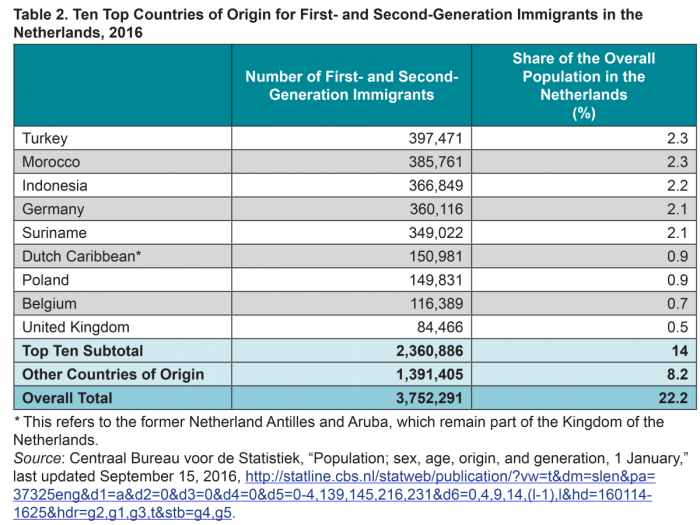 Today, nearly one-quarter of Dutch inhabitants are first- or second-generation immigrants—close to the proportion in the United States. And newcomers are concentrated in what the Netherlands’ Central Bureau of Statistics refers to as “nonwestern” immigrant groups (from Turkey, Africa, Asia, and Latin America). Between 1996 and 2015, the share of nonwestern immigrants and their children rose from 8 percent to 12 percent of the overall population. And with about 1 million Muslims (6 percent of the population according to the Pew Research Center), the Netherlands is the second most Muslim-dense country in Western Europe. As is the case almost throughout the industrialized world, immigration is also the principal factor driving population growth in the Netherlands. Between 1960 and 2015, the share of the Dutch population ages 65 or older doubled (rising from 9 percent to 18 percent), while the share ages 14 or younger fell from 30 percent to 17 percent. Fertility rates, meanwhile, fell from 89.0 per thousand to 45.4 per thousand in the same time period. Immigration has led to the relentless diversification of Dutch society, particularly in the largest cities where many immigrants settle. Half of the population in Amsterdam, Rotterdam, and The Hague (and one-third of residents in Utrecht) are first- or second-generation immigrants, and most come from nonwestern countries. In 2013, 5 percent of Dutch residents practiced Islam, a number that rose to 10-14 percent in these main cities. Looking Ahead: Has the March of Populism Been Thwarted? The idiosyncrasies of the Dutch system may offer few lessons for the rest of Europe, even as there is feverish speculation about the effects of Wilders’ performance on the upcoming French elections. National Front leader Marine Le Pen is a likely front-runner. But while she is poised to win a large share of the vote in the first round of presidential elections on April 23, she is unlikely to cement those gains in the subsequent runoff election in May. The temptation to suggest that the core drivers of populist, anti-immigration political movements are shared across countries is extremely strong. And there are good arguments that support that narrative. However, it is equally, and perhaps more, important to also understand that each populist party has intense sui generis elements that involve different political contexts and roots, vastly different electoral processes and government structures, and revolve heavily around the charismatic personality of individual candidates. At the same time, it is clear that Europe’s long dance with increasing openness toward immigration may be nearing another inflection point, with politicians of many political stripes hardening their positions across the continent. Whether this is a cause or effect of the rise of the radical populist right remains to be seen.